An essay contest in Three stages open to all current full-time registered students in an undergraduate architecture degree program, undergraduates majoring in architecture, or diploma students in accredited schools of architecture worldwide. 15,000USD Purse. 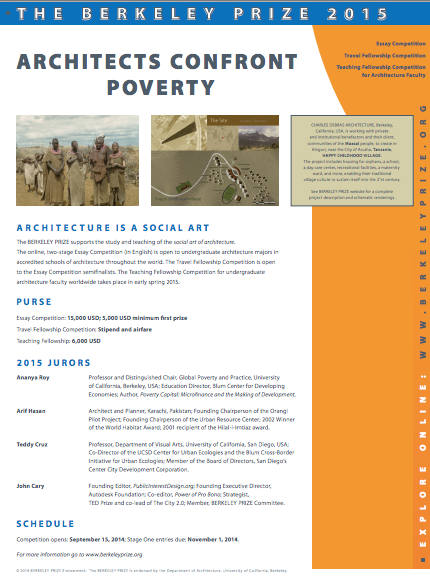 The BERKELEY PRIZE Competition was established in 1998, made possible by a generous gift of JUDITH LEE STRONACH to the Department of Architecture in the College of Environmental Design at the University of California, Berkeley. January 17, 2015. Dencity Competition 2015 open to architects, planners, students, engineers, designers, thinkers, NGOs and organizations from all over the world! Click here for more information and to register.